William Jefferson Clinton was born on August 19, 1946, in Hope, Arkansas. As a delegate to Boys Nation while in high school, he met President John Kennedy in the White House Rose Garden. The encounter led him to enter a life of public service. Clinton graduated from Georgetown University and in 1968 won a Rhodes Scholarship to Oxford University. He received a law degree from Yale University in 1973, and shortly thereafter entered politics in Arkansas. He was defeated in his campaign for Congress in Arkansas's Third District in 1974. The next year he married Hillary Rodham, a graduate of Wellesley College and Yale Law School. In 1980, Chelsea, their only child, was born. Clinton was elected Arkansas Attorney General in 1976, and won the governorship in 1978. After losing a bid for a second term, he regained the office two years later, and served until his 1992 bid for the Presidency of the United States. Elected President of the United States in 1992, and again in 1996, President Clinton was the first Democratic president to be awarded a second term in six decades. Under his leadership, the United States enjoyed the strongest economy in a generation and the longest economic expansion in U.S. history. President Clinton’s core values of building community, creating opportunity, and demanding responsibility resulted in unprecedented progress for America, including moving the nation from record deficits to record surpluses; the creation of over 22 million jobs—more than any other administration; low levels of unemployment, poverty and crime; and the highest homeownership and college enrollment rates in history. His accomplishments as president include increasing investment in education, providing tax relief for working families, helping millions of Americans move from welfare to work, expanding access to technology, encouraging investment in underserved communities, protecting the environment, countering the threat of terrorism and promoting peace and strengthening democracy around the world. His Administration’s economic policies fostered the largest peacetime economic expansion in history. 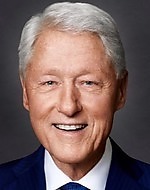 President Clinton previously served as the Governor of Arkansas, chairman of the National Governors’ Association and Attorney General of Arkansas. As former chairman of the Democratic Leadership Council, he is one of the original architects and leading advocates of the Third Way movement. Following the 2002 Barcelona AIDS Conference, President Clinton began the Clinton Foundation HIV/AIDS Initiative (CHAI) to assist countries in implementing large-scale, integrated, care, treatment and prevention programs that will turn the tide on the epidemic. It partners with countries in Africa, the Caribbean and Asia to develop operational business plans to scale-up care and treatment. CHAI works with individual governments and provides them with technical assistance, human and financial resources, and know-how from the sharing of the best practices across projects. The ultimate objective in each of these countries is to scale up public health systems to ensure broad access to high-quality care and treatment. The Initiative’s long-term goal is to develop replicable models for the scale-up of integrated programs in resource-poor settings. CHAI is currently bringing life-saving care and treatment to over a quarter of a million people around the world. In September 2005, President Clinton hosted the inaugural meeting of the Clinton Global Initiative (CGI). CGI is a non-partisan catalyst for action, bringing together a community of global leaders to devise and implement innovative solutions to some of the world’s most pressing challenges. The inaugural meeting brought together 35 current and 10 former heads of state along with hundreds of other leaders from governments, the business community, and NGOs who contributed to innovative solutions to alleviate poverty, promote effective governance, reconcile religious conflicts, and protect the environment. Nearly 300 commitments were made to improve the lives of people living on 6 continents, with private corporations and non-profit organizations pledging almost 70% of all commitments, which are valued in excess of $2.5 billion. President Clinton is also a best selling author, and is married to Senator Hillary Rodham Clinton (D-NY). They reside in New York.